When you get a better understanding of what SEO is all about, you will quickly realize that the functionality of SEO depends on many factors. With time these factors change and new factors emerge. This is mainly because search engines are regularly updated. These updates ensures that search engine users get the most valuable and relevant content. As a website owner you definitely need to be aware of the latest developments about SEO. This way you will get optimal results with SEO and you will gain an advantage over your competitors. 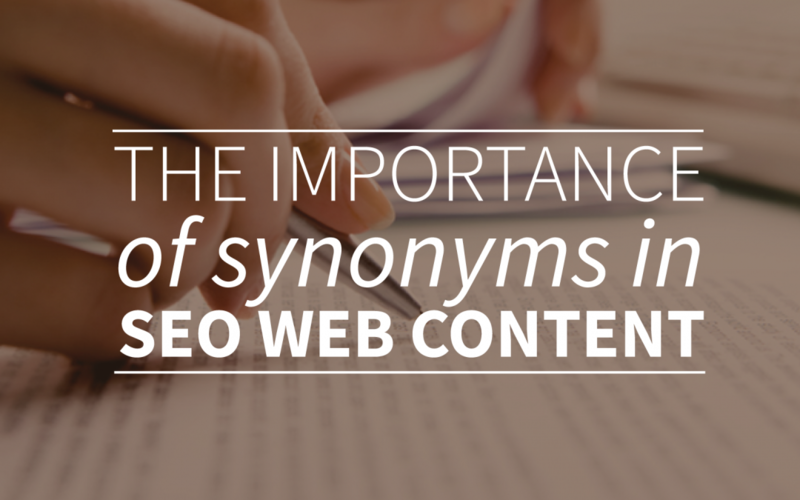 A relatively new development in SEO is the use of synonyms. By using synonyms you will not only make the text on your pages more attractive to visitors but also to search engines! Synonym literally means “word with (almost) the same meaning”. Synonyms can also be related to search results. Suppose you search for the word “pictures”, a related search results can be “photos”. When choosing keywords for your website, it is very important to consider its corresponding synonyms and how well it’ll fit into your web content. Supose you have a web shop where you sell photos and on all the pages you only focus on the keyword: photos. Then potential customers cannot find you when they search for pictures on Google. Some search engine users might also search for both terms. But it would be unfortunate if potential buyers are not able to find you because of this mistake. Try to visualize in your mind, “what terms would my target audience search for”? You can use personas to answer this question. Before you start, write down as many synonyms as possible which you can use for your page, this will be the base for your new web-text. This will help you avoid focusing on one particular keyword. When you use webtexttool you can “test” synonyms when you are creating a new page. You can do this by filling in the synonyms to the keyword option and then select the “analyze and give suggestions” option. Perhaps you will find some good suggestions which you could use for your page. It sounds pretty easy using synonyms right? Synonyms can attract new visitors to your website. If you want to make sure that you use synonyms the right way, you should try to use our free webtexttool trial. How do you feel about the use of synonyms? Let us know @twitter!